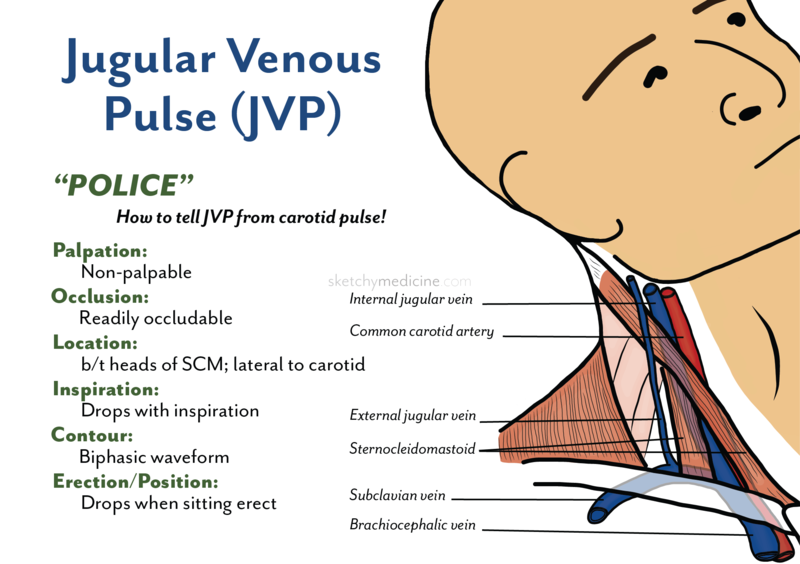 The jugular venous pulse/pressure (JVP) is a favourite topic on the wards! The jugular veins fill with blood and pulsate in relation to filling in the right atrium. Since the JVP correlates well with central venous pressure, it’s used as an indirect marker of intravascular fluid status. Traditionally, the right internal jugular (IJ) vein is used in JVP measurement; it’s preferred since it is directly in line with the superior vena cava and right atrium. The external jugular (EJ) vein is not commonly used to assess the JVP because it has more valves and an indirect course to the right atrium, but EJ is easier to see than IJ, and JVP measurements from both sites correlate fairly well. The left-sided jugular veins are also uncommonly used, since they can be inadvertently compressed by other structures and thus be less accurate! Palpation: The carotid pulse is easy felt but the JVP is not. Occlusion: Gentle pressure applied above the clavicle will dampen the JVP but will not affect the carotid pulse. Location: The IJ lies lateral to the common carotid, starting between the sternal and clavicular heads of the sternocleidomastoid (SCM), goes under the SCM, and when it emerges again can be followed up to the angle of the jaw. The EJ is easier to spot because it crosses SCM superficially. Inspiration: JVP height usually goes down with inspiration (increased venous return) and is at its highest during expiration. 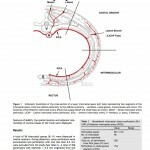 Contour: The JVP has a biphasic waveform, while carotid pulse only beats once. Erection/Position: Sitting up erect will drop the meniscus of the JVP, while lying supine will increase filling of the JVP. To measure the JVP, the patient lies supine in bed at a 30 – 45 degree angle, with their head turned slightly leftward and jaw relaxed. A hard light source (e.g., penlight) pointed tangential to the patient’s neck will accentuate the visibility of the veins. Once the highest point of JVP pulsation is seen, measure high how it is at its maximum, in terms of centimeters above the sternal angle (aka Angle of Louis, at the 2nd costal cartilage). The JVP normally is 4 cm above the sternal angle or lower; increased in fluid overload and decreased in hypovolemia. Beigel R et al. 2013. Noninvasive evaluation of right atrial pressure. Journal of the American Society of Echocardiography: 26;1033. Chua Chiaco JMS, Parikh NI, Fergusson DJ. 2013. 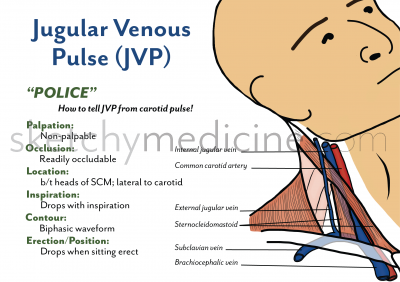 The jugular venous pressure revisited. Cleveland Clinic Journal of Medicine. 80;638. Cook DJ, Simel DL. 1996. Does this patient have abnormal central venous pressure? Journal of the American Medical Association: 275;630. Vinayak AG, Pohlman AS. 2006. Usefulness of the external jugular vein examination in detecting abnormal central venous pressure in critically ill patients. Archives of Internal Medicine: 166;2132. Wang CS et al. 2005. Does this dyspneic patient in the emergency department have congestive heart failure? Journal of the American Medical Association: 294;1944.